An assignment I was working on recently required me to unzip a file in an SSIS package. I didn’t knew it – so I asked my mentor Rushabh Mehta sir about it and he was kind enough to email me a demo. Now based on the deemo, my next task was to input couple of configuration’s like location of zipped file and then i was good to go! And so i learned something new, and I just thought of documenting it. SSIS Task used: I’ll be using the Execute process task to carry out the task. 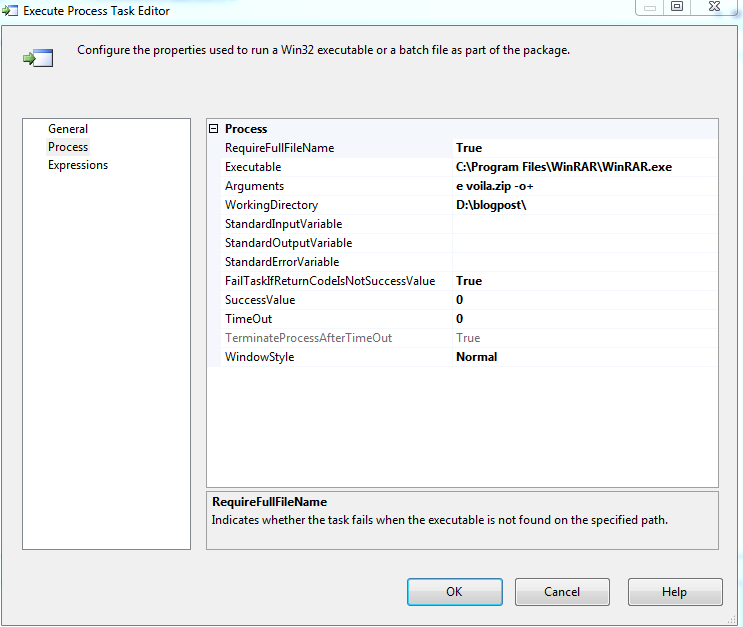 Now, here is the configuration of the Execute process task. Thank you – and it was nice meeting you at North Texas SQL server UG! I was looking for this solution for last 5 hours, finally this post solved my issued.. Thanks a lot man. Thank you for this solution!!! please help me out in implementing how to unzip the files. the thing is it needs to pick the zip file in particular location and unzip there by creating folder same as zip file name and then contents of zip file should be placed in that folder. please help, I am looking for this solution from last 2 weeks. using C:\Windows\System32\compact.exe for the executable dosen’t appear to work. any ideas?